1500 Clients can’t be wrong! 35 years of industry expertise. Making great workspaces is what we care about. By connecting office plants and creative design excellence, we achieve this for our clients. We give you amazing, lush green spaces to work in. Introducing plants into your workplace has more than just a visual affect. It creates a healthier workplace for everyone. To achieve this, we visit you on site, consult and recommend a perfect match for your office by supplying planters in your desired colour and a style that works. It’s all about you. Our range of indoor plant hire services includes installing modern planters and maintaining plants from tropical to trailing or lush to structured. Put simply, your plants will always look great! 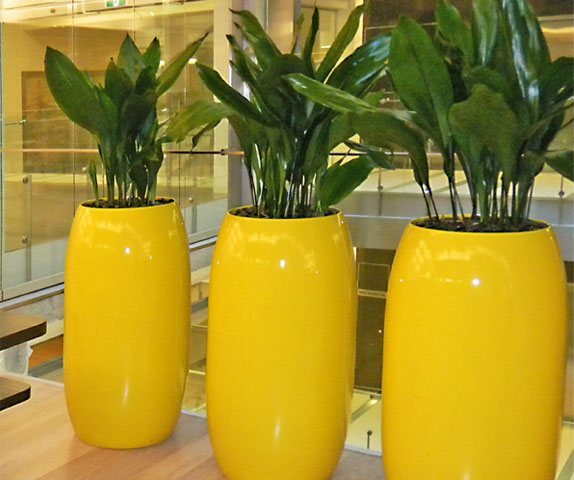 We provide an office plant hire service in Sydney and throughout Australia. For innovation and WOW, you can’t go past our bespoke Moss Walls. No one walks past them without being impressed. Soft and Cool to touch, they are the latest in maintenance free vertical green design. Check out some of our Vertical Garden and Green Wall projects. Then, tell us your perfect idea of vertical greenery. If it’s in your head, we want it in your workspace! We are the innovators for thriving green walls. 1500 Clients can’t be wrong! Our client’s testimonies speak for themselves. With over 35 years of industry expertise we never let up on being ahead of the game. Accredited with our industry body, Interior Plantscape Association, we know how to achieve the results you want. Thank you for helping us make our office at Sydney Olympic Park so special. The plants look fantastic and your service has been excellent. Everyone loves the environment they work in and this has a lot to do with the plants you supply. The Moss Wall is a real 'wow' factor and certainly contributed immensely to the project outcomes. It gets comments daily and anyone who views it would not walk away unimpressed. Thank you for your professional contribution and participation in this project. You're proficient service and installation made working with Green Design a pleasure and I look forward to working with you on future 'award ·winning' projects. Adding plants and making changes has never been any trouble and it’s always been a pleasure dealing with your team. Our new office looks stylish and welcoming and the plants have played a big part in achieving this. It’s simple. Your plants will always look great!